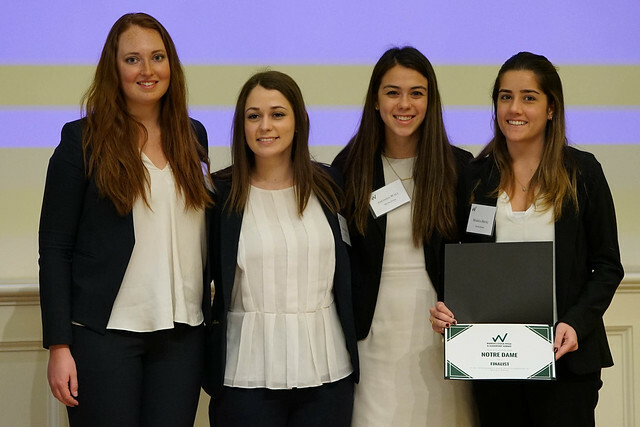 On March 23-24, Sarah Graney, Marina Hrosz, Erin Martinez and Amanda Wall, members of the Wall Street Club, competed in William & Mary’s 2nd annual Women’s Leadership Summit and Stock Pitch Competition held at the Raymond A. Mason School of Business. These four women were tasked with presenting a buy recommendation of a stock of their choice for an endowment fund with a twelve-month investing horizon. To determine which stock they should choose, each of these four students presented their own stock and pitched it to Kevin Burke, Managing Director for the Notre Dame Institute for Global Investing (NDIGI) and Bryan Jackson, an ‘09 Notre Dame graduate working for Blue Harbour Group as a Principal Investment Analyst. After critiquing each pitch, the stock chosen by the team was Trupanion, a pet medical insurance company. With their investment stock pitch determined, they were able to begin the preparation process of creating the deck for the competition. They presented their first draft to Jackson so he could make suggestions, comments and edits on their work. After three weeks of preparation, the women were ready to present. The Women’s Stock Pitch competition served to demystify the stock pitch process and the finance industry in a constructive manner, while also enabling the participants to gain invaluable real world experience by presenting an investment opportunity with a buy recommendation. The stock pitch competition allowed its participants to immerse themselves in focused research on their chosen stock, compile the information they found into a cohesive story, and create a credible and convincing pitch. Through this process, the participants were able to experience professional development and develop their networking, communication, presentation, and soft skills. More than 50 professional women and nearly 100 students from top universities from across the the world participated in the event, making it a great way for women in the financial services field to interact with an excellent pool of young professionals. “Besides winning third place, I really enjoyed talking to the professional women about what it means to be a woman in finance- especially since many of them were the first woman in their firms” said sophomore Amanda Wall. Sophomore Erin Martinez also expressed the importance of being able to network with leading financial professionals. "I had a great experience at the Women's Stock Pitch Competition. It was great to hear from Ursala Burns, the former CEO of Xerox. She offered a lot of quality advice regarding balancing a career in finance with other important aspects of life." NDIGI is committed to creating a pipeline of women prepared to succeed in the financial services industry. By helping students become involved with events like William & Mary's Women's Stock Pitch Competition, NDIGI is able to help women understand the variety of options available for them post graduation.